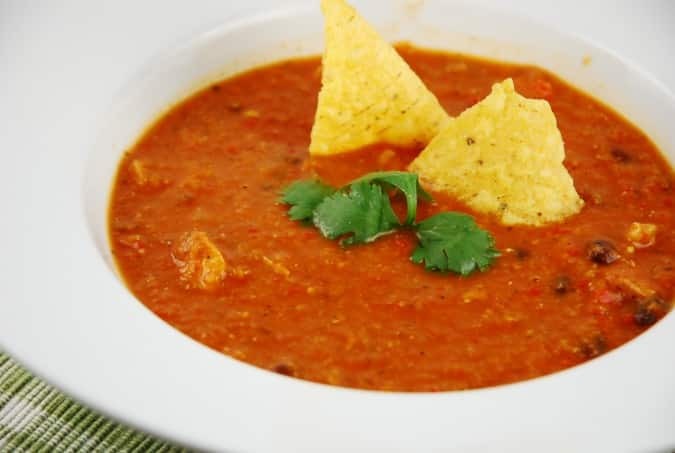 I always love ordering chicken tortilla soup at my favorite Mexican restaurant. But depending on how it’s prepared, this dish can be dangerous in terms of Weight Watchers Points. Adding in your favorite fixin’s can really rack up the extra fat and calories too. After a bit of work in the kitchen, I came up with own version that is a LOT healthier than the restaurant version, but very healthy and low in Points. And don’t worry – my chicken tortilla soup recipe still includes the cheese and tortilla strips. By using a hand blender to puree the soup, it helps to give the soup a creamy, velvety feel, without adding any high fat milk or cream. My kids love it too, because they have no idea they are eating so many vegetables! And you can top it with fresh red onion, jalapeños, or avocado for an extra boost of flavor, if desired. This satisfying soup will fill you up and thrill your tastebuds too. Enjoy! Healthy, filling, and wonderfully flavorful, this soup is sure to become a family favorite. Authentic flavors, but half the fat and calories of a restaurant version. Preheat oven to 375. Line a rimmed baking sheet with foil or parchment paper. Mist with cooking spray. In a small bowl, combine the cumin, chili powder, garlic powder, salt and pepper. Place chicken breasts on baking sheet and mist with cooking spray. Sprinkle about half of the spice mixture over both sides of the chicken breasts. Place in the oven, and roast the chicken until cooked through, about 20 minutes. Then, remove chicken from oven, allow to cool for 5 minutes, then shred with two forks. Set aside along with the chicken juices from the baking sheet. While chicken is cooking, heat the oil in a large pot or dutch oven over medium high heat. Add in the onion, garlic, and bell peppers. Cook until onions begin to turn translucent, about 3-4 minutes. Stir in the rest of the spice mixture, tomatoes, chiles, corn, cornmeal, chicken broth, and cilantro. Bring to a simmer and then reduce heat to low. Using a hand blender, puree the soup while in the pot until mostly smooth. Add in the beans, lime juice, chicken, and any chicken juices from the baking sheet. Cover and cook on low for about 10 minutes. Divide tortilla strips and cheese between 8 bowl. Then ladle hot soup over them and serve.